HardMarque is a digital design and manufacturing studio focused on creating “Future Factories”, additive-manufacturing facilities that focus on just-in-time production and delivery of custom, made-to-order parts ordered through the Internet. HardMarque feels that this type of innovation is imperative to the future of manufacturing in its home country of Australia. This innovation can help the country break into new markets by emerging from the constraints of traditional manufacturing. Nicholas Hardman, Director of HardMarque is a long time CAD user who upon discovering Evolve, was immediately taken by the organic structures created in the software, as well as its ease of use. One of HardMarque’s most recent projects for its “Future Factory” was a custom made, titanium additive manufactured automotive piston. HardMarque selected titanium for this project as it is readily available in its home country of Australia and is significantly stronger than aluminum, which is typically used in piston production. For Nicholas, the design process started with an existing piston for benchmarking. He used the measurements of the piston to create an initial design space in Evolve. After the design space was created, he exported the model to Inspire for concept generation. In the case of the titanium piston, applying accurate loading conditions was absolutely imperative to the process. “It’s about getting the loads going through the piston correct,” said Nicholas, “there’s a force acting on the piston crown from the expanding combustion gas, and there’s also lateral force acting on the sides of the piston from oil pressure against the cylinder wall.” Nicholas collaborated directly with the Altair team, as well as a colleague in Melbourne with over fifteen years of experience in piston production to apply these loads in Inspire. 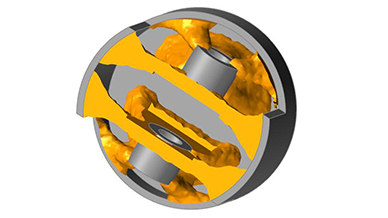 Nicholas used Inspire to generate the ideal shape for the piston based on these loading scenarios. Nicholas then imported the shape created in Inspire back into Evolve where he was able to interpret the results into the final piston design, which was manufactured in titanium. The final design weighed 289g, which was 23.5% lighter than the 378g original, yet just as strong. 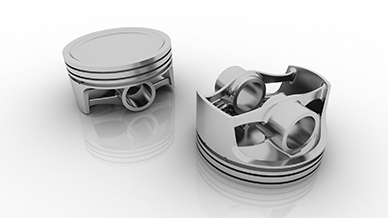 Reimagine the current piston design process to manufacture a piston that is not only lighter than the current versions, but also equally as strong. Concept generation in Inspire and refinement in Evolve. Development of new piston design that is 23.5% lighter than the original design. Easy export and integration with additive manufacturing equipment. Manufactured using titanium additive manufacturing. HardMarque looks at parts and products and wonders how they can be improved. The team tries to figure out how parts can be made better, faster, or cheaper. HardMarque focuses on additive manufacturing, material optimization, 3D CAD design, and 2D CAD drafting.